Likno Web Scroller jQuery Slider Builder 2.1.148 Free Download - Rich interface to create any jquery slider/scroller with minimal HTML/CSS code! * Create cross-browser jQuery sliders to display content that scrolls horizontally or vertically when visitors click on (or mouse over) special navigation arrows, bars, or bullets, from a variety of designs. * Make the slider behave as a &quot;SlideShow&quot;: its items scrolling (sliding) automatically, one at a time, at specified duration and direction, with looping or not, pause on &quot;mouse over&quot;, etc. * Use simple text, HTML code, images, photos (Flickr, Picasa, etc. ), videos (YouTube, etc. ), animations, Flash as the content of your scroller items. * Create any type of website scroller or slider, such as: image slider, slideshow, vertical scroller, horizontal scroller, jquery carousel, text scroller, jquery slide, etc. * Edit the style of your scrollers through CSS (&quot;css slider&quot;). * Position your scrollers easily on page, with many options: 1. Insert into (or replace) a page element (div, span, td, etc.) OR image (img) of your choice. 2. &quot;Float&quot; relative to any corner of the browser window OR a page element OR an image. * Use 4 methods to populate your jQuery slider with content: by the project itself, UL/LI elements in page, DIV elements in page, RSS/ATOM/XML feeds (also Flickr, Picasa, etc.). Statement: First, please download the orginal installation package by clicking the download link. Of course you may also download it from the publisher's website. 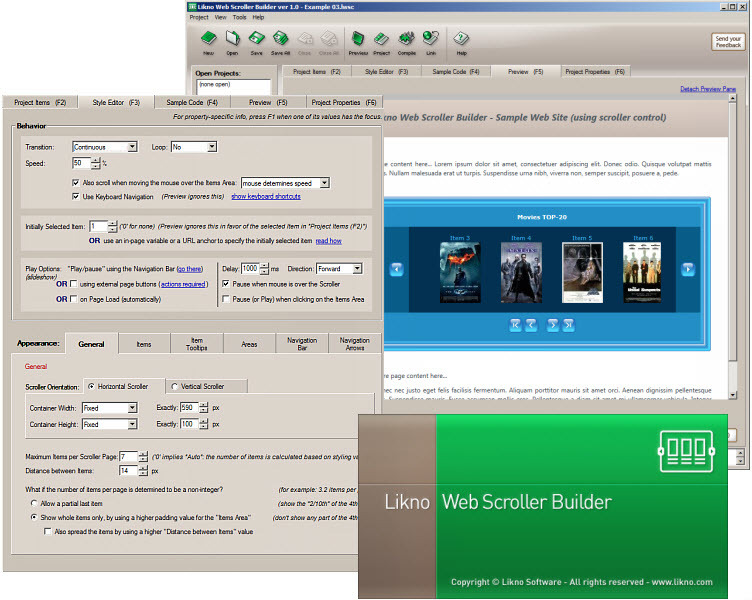 Using Likno Web Scroller jQuery Slider Builder crack, key, patch, serial number, registration code, keygen is illegal. The download file hosted at publisher website. We do not provide any download link points to Rapidshare, Hotfile, Depositfiles, Mediafire, Filefactory, etc. or obtained from file sharing programs such as Limewire, Kazaa, Imesh, Ares, BearShare, BitTorrent, WinMX etc. Software piracy is theft. If you like Likno Web Scroller jQuery Slider Builder please buy it.